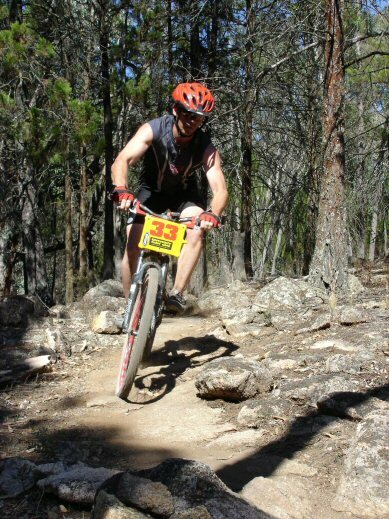 The Beechworth Chain Gang maintain both the Beechworth Mountain Bike Park, and the Flametrees trail, which is located about 5km out of town alongside the Murray-to-Mountains rail trail. For trail maps click here. Trail maps are also available on TrailForks. If you’re out on the trails and notice any maintenance issues (like fallen trees) please let us know either by email (secretarybcg@gmail.com) or via our Facebook page so we can get out there quickly and sort it out. Location: Alma Road Beechworth, just on the outskirts of town here. Description: The MTB Park is on a compact plot of land punctuated by granite. Tightly-wound and over varied terrain, the ride options suit beginners through to advanced riders. The 10km Intermediate Cross Country Loop takes in the entirety of the available park land. You’re unlikely to recognise how tightly the trails are packed in as you fly through fast flowing sections or have your head down grinding up the technical climbs that punctuate the descents. Composed of a number of named segments, highlights include the rocky ridgeline of Rusty Stuff, the sustained fast flowing descent of Secret Track and for those who like a challenge, ‘Need Pizza’ that takes you from the lowest point of the park back to the carpark via a series of switch backs that can leave you out of breath. The Snakes and Ladders track is an intermediate grade enduro trail that starts at the highest point of the park and finishes at the lowest. It has loads of berms, jumps and other interesting features using the local granite. The 1.2km Green Loop is an excellent way for novices to improve their skills and makes an excellent warm up loop for the more experienced riders. Its also great for kids. The loop has been designed with an increase of obstacle size and type as you progress around the circuit. There is also a short course downhill (advanced grade) and jumps track near the carpark. “Don’t be a hero” is a new, short downhill (advanced) track that demands focus. “Dr Hong’s Prune Candy” is a new Double-black Diamond downhill track that promises to short out the goats from the sheep. Exercise extreme caution. Please use caution when riding on trails that you have not ridden for some as they may have changed. PLEASE NOTE: Several significant sections of the Flame Trees trail are temporarily closed due to damage incurred in the major storm event in December 2018. Please keep an eye on our Facebook page for details of it’s recovery! Gradient: Don’t be fooled by the 2% Strava gradient – the climb is punctuated by some great technical climbing and natural obstacles that make this a great challenge at speed. Location: A quick 5 km spin down the Rail Trail from Beechworth towards Everton finds you at the old Baarmutha railway station site and carpark – and the beginning of the Flame Trees loop. Alternatively its a short drive from town down Diffey Road to the rail trail crossing and carpark. Description: Designed to be ridden in a clockwise fashion, the trail begins with a sprint in open grassland before entering the trees and gradually descending. While suitable for the entry level rider, the combination of rocks and multiple gradient changes pose a challenge for the more accomplished rider wanting to lay down a fast lap. Multiple short but technical descents into the shaded gullies beside the rail trail are followed by snaking switchbacked climbs. There’s a fast snaking run-out that marks the end of the downhill – a quick right hand around a knoll and across the rail trail and you’re at the beginning of the uphill leg. Towards the top of the climb the trail snakes on and off the rail trail before finishing on the open grass plain that marked the beginning of the loop.